Thank you to everyone who has helped make 2010 a fantastic first year for Acton Walkways! With over 1,000 walkers, 7,000 visits to our website, good media, and many emails of thanks and positive feedback, we are thrilled with the community response. We will be taking a break over the hot summer months, and will continue with our guided tours in April 2011, kicking off with a number of events to celebrate the ACT Heritage Festival. 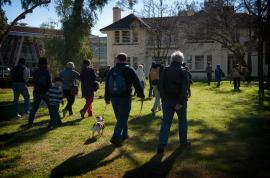 For all those people staying in Canberra over the break, the Wednesday lunchtime walks will continue, and we welcome all to join us (meet at the Street Theatre every Wednesday at 12pm, walk lasts one hour). Happy Holidays and New Year and we look forward to seeing you again in 2011.